Tomorrow, Friday 23rd November 2018, SMA Parish Wilton will mark Black Friday. Black Friday has entered into our culture as a very early pre-Christmas shopping frenzy. It originated in the 1960’s in the United States and is increasingly a major consumerism rush adopted by retailers in the western world. 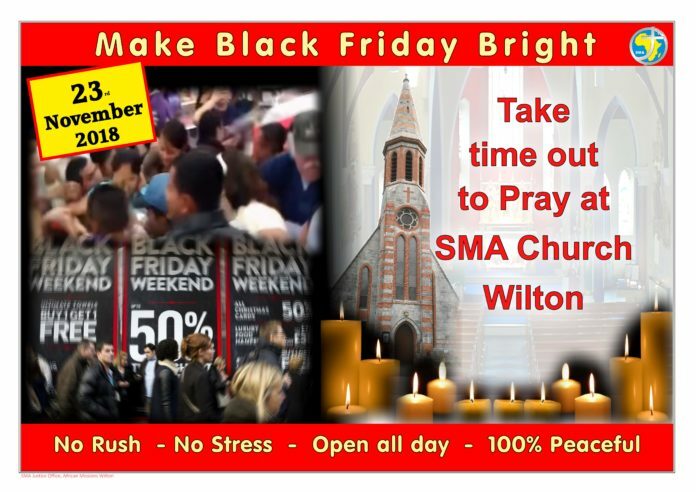 It’s a day when we will see lines of cars, bumper to bumper, heading for the ‘Black Friday’ bargains in the shopping centre adjacent to Wilton parish. Many of will be searching for that mythical and elusive crock of gold at the rainbow’s end of our anticipatory shopping lists. Members of the Parish are hosting a day of Quiet Prayer to coincide with the day. From 8 am to 11pm Wilton SMA Church will be open, inviting people to come and reflect on the true meaning of Advent and Christmas. All are welcome to spend time with us on the day. Come when you wish and go when you want.